It’s so nice to relax in your outdoor living space and spend time bonding with kids in your garden with fresh air, colorful flowers, trees, and green grass around. While it’s crucial to water the plants and mow the lawn, a beautiful garden should be organized and clean. So, let’s check these helpful tips to maintain the cleanliness in your garden! You can remove leaves by cleaning the garden yourself. You can also hire a rubbish removal service, like 1300 Rubbish Removal, if you can’t manage to do it due to your busy schedule or you have no appropriate tools available. Pruning damaged branches and stems is a good practice to prevent plant diseases from spreading or damaging the whole plant. You store garden tools, such as spades and rakes, in your garden shed to avoid accidents and keep your garden clutter-free. Dispose of leaves, stems, and branches into a compost heap or separate bin. You can recycle them and use it as fertilizer for your plants. Garden gnomes or statues can promote mold and moss growth and can easily collect dust during hot seasons. Clean them regularly. Garden fountains and ponds should be cleaned. Fill them with clear water. Don’t keep stagnant water in them. A garden hose can be a huge mess. It’s a smart idea to invest in a garden hose reel to keep the hose neatly gathered, making your yard feel instantly more organized and preventing slip accidents. 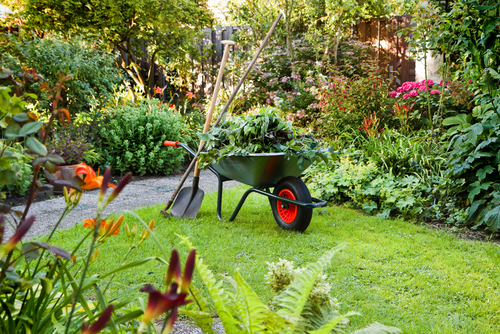 Maintaining a beautiful and clean garden shouldn’t be stressful. You can dedicate 10 to 15 minutes a day or every other day to clear the garden of rubbish and clutter as a way of relaxing and as a bonding activity with your family.